Interesting take on two well worn horror tropes. It's lurid nature isn't for the sensitive. A solitary figure stands on a city rooftop looking down on a swarm of the living dead whilst the city burns. Flashback to Kuala Lumpur and from the balcony of their appartment looking upon a fireworks dislay set against the Petronas Towers, Laila, a friend and visitor Anson are discussing another breakout of subdead and decide to have a closer look at what’s unfolding nearby. The Extinction Parade from Max Brooks writer of the critically acclaimed World War Z might feature the living dead but this is an entirely different story about a different war. The introductory page sets up an initial tease of carnage, anarchy and zombies swarming the streets whilst an unknown figure looks on from the safety of an ornate rooftop. This unknown figure is the narrator of The Extinction Parade. There are plenty of ideas to be found here and the narration ,told in flashback, is rife with details pertaining to the world that this story is set in. The narrator and her friends are vampires who refer to the living dead as ‘subdead’ and the humans as ‘solbreeders’, it’s quickly established that outbreaks of subdead are nothing new but lately they were becoming more frequent. 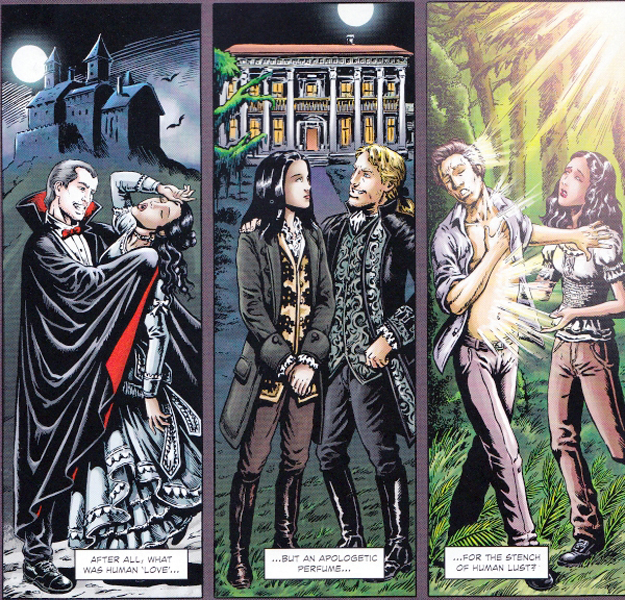 The three eras of vampires. Brooks doesn’t take long in establishing his vampires who are attractive, possessing of superior strength and the ability of flight. One of the books biggest strength’s is also it’s biggest weakness and that is a lot of the story here is told via narrative dialogue boxes. These outnumber speech bubbles of character dialogue by a considerable amount, this isn’t neccesarily a bad thing but seems to speak to having a writer more accustomed to writing novels than comics. The story jumps around chronologically with its opening page segueing into a flashback and a further flashback before leading to events which seemingly link back to that opening image. Due to the narrative style of the story though this isn’t as confusing or fractured as it may have been with a more traditional speech bubble approach to the story. Telling a story from a vampires perspective also gives the narrative a different view to the norm, with the vampires looking at the solbreeders and the subdead with equal contempt not sure which is more stupid. There’s a neat example of the perception of time completely distorting for the immortals as the narrator remarks ‘so much jungle had vanished, in what seemed the blink of an eye, replaced by motorways, tract housing, and mile after mile of palm oil plantations’. One half page rather brilliantly takes in Hollywood’s take on the ‘classic’ vampire before moving on to Interview with a vampire and finishing off with Twilight all under the guise of explaining how attraction works for vampires. There’s plenty of potential in this story and that opening page is full of intrigue, it’s also refreshing to have a story without a ‘hero’ . A flashback scene depicting the unnamed narrator and Laila taking full advantage of the Malayan Emergency in brutal fashion demonstrates both some research on Brooks’ part and just how far away from ‘hero’ the narrator is. Raulo Caceres art will amaze or appall depending on your taste. The level of detail in the several double page depictions of the living dead shambling through city streets is mind boggling and is up there with the likes of Juan Jose Ryp. One double page features an appartment building aflame with panicked residents, smashed cars and a myriad of zombies all of which look different. With some merely shambling through the carnage, whilst others gorge on unfortunate victims, while severed limbs and blood litter the floor. 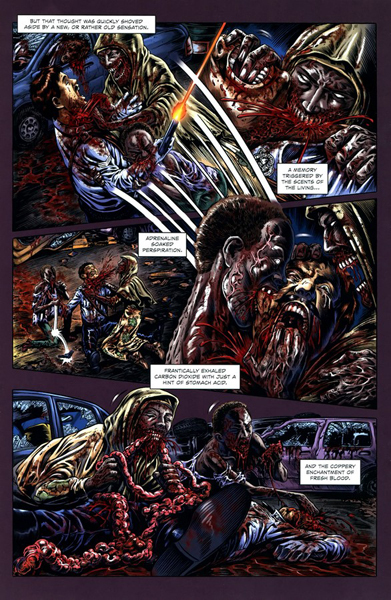 One page featuring the narrator looking on depicts a survivor desperately trying to escape only to be overwhelmed and torn apart in bloody fashion, with his throat torn out and the undead chewing on his glistening intestines amidst the backdrop of crashed cars.